Summary: The Back in the Swing Cookbook is a life-affirming book full of 150 feel-good recipes that are easy to prepare, with fresh ingredients specifically designed to help breast cancer survivors get back in the swing of joyful, healthy living. It's a book that you will love to hold in your hands, and use in the kitchen, as a friend and guide to delicious meals and a lifestyle that makes you feel positive. In addition to fabulous food and drinks, the beautiful pages include luscious photographs and fun-to-read, smart, friendly nuggets on topics ranging from genetics, lifestyle choices, and the environment to the influence of all three on living a full and happy life. I was extremely excited when THE BACK IN THE SWING COOKBOOK: RECIPES FOR EATING AND LIVING WELL EVERY DAY AFTER BREAST CANCER by Barbara C. Unell and Judith Fertig arrived on my doorstep. I was immediately drawn to the gorgeous cover, but when I actually read the subtitle for this cookbook, I was even more impressed. Back in the Swing USA is a nonprofit organization dedicated "to improving and protecting well-being by supporting survivorship education for consumers and healthcare providers, and promoting access to personalized, comprehensive survivorship clinical care." Basically THE BACK IN THE SWING COOKBOOK is a wonderful resource for women who have been diagnosed with breast cancer. Upon first glance, you might think this cookbook isn't for you; however, let me assure you that the recipes (and advice!) in this cookbook are for every woman... regardless of whether you are one of the more than 2.5 million breast cancer survivors in the United States. The 150+ recipes are wonderful and healthy, and this entire cookbook appealed to me for so many reasons. First and foremost, THE BACK IN THE SWING COOKBOOK is gorgeous! There are lots of photographs (although not one for each recipe) and the entire cookbook is filled with inspirational quotations from cancer survivors as well as nutritional information on various cancer-busting foods. The cookbook begins with a brief history of the Back in the Swing USA organization as well as how the cookbook can to be. It also includes a list of Back in the Swing Key Foods -- which we all should be striving to eat, as well as some other helpful eating advice -- which we all should be following! The cookbook is organized like a typical cookbook... except it does begin with the Dessert chapter -- see I told you it's really geared towards women! It's divided into the following chapters: Desserts; Breakfast; Beverages; Appetizers and Snacks; Salads and Side Dishes; Soups, Stews, Risottos, and More; and the Main Event. 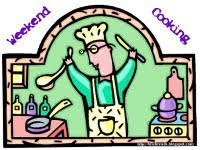 The cookbook ends with some valuable information including New Horizons in Prevention and Menu Planning Ideas. I especially appreciated all of the inspirational advice and research findings that were interspersed throughout the recipe sections of the cookbook. The next recipe that I tried was for a healthy and light dish called Orzo with Spinach, Garbanzo Beans, and Feta. I loved this recipe because it contains some of my favorite foods (which I always have on-hand) and it was so simple to make. I was very impressed with how well my meal looked and wouldn't hesitate to serve it as a main dish or side again! Seriously, there are about 20 more recipes that I'm dying to try. Some of the ones that look good to me include: Persian Rice Pudding, Mexican Fruit Salad with Honey-Lime Dressing, Mushroom and Broccoli Risotto, Cheese Tortellini with Artichoke-Roasted Red Pepper Sauce, and Shrimp Fra Diavolo. In addition, there are so many salads with delicious dressings that I admit I'm a bit overwhelmed just trying to determine which ones to try first. 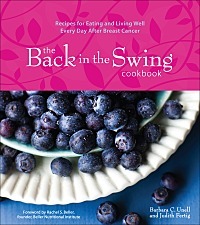 THE BACK IN THE SWING COOKBOOK would naturally make a thoughtful gift to any women who has been diagnosed with breast cancer, but it's also a wonderful gift idea for any special woman in your life. I just loved this cookbook from the healthy recipes to inspirational messages; and I highly recommend it. I'll be reviewing this cookbook soon - I loved it too! Me too! Loved this and can't wait to review it. This is going on my list right now. I have the feeling I'm going to love it! What a wonderful idea, and the recipes sound delicious! I have an aunt that is a survivor...this would be a perfect gift. The orzo looks yummy! Looks like a nice cookbook. Very cool and good eats for everyone, it looks like, not just breast cancer survivors. The Orzo Spinach Salad looks wonderful; there seems to be many recipes I would make from this book. Thanks for the review. Your review and the picture of the orzo salad have me sold on this cookbook. That salad looks like the perfect light summer meal!